Who said finding a job was easy? More often than not it’s a struggle to find a job that meets all your requirements – skills required match your expertise, the pay is good and it is located locally. Job location can be the killer. There are so many jobs out there that are perfect, until you realise it would take hours to travel from your house to the job and back every day. I hear friends and family complain that the best jobs are located miles away. So what exactly are we missing? Surely all the best jobs aren’t out of reach for everyone, we just need to know where to look for local jobs. • Use job search engines to your advantage. It is so easy to apply for hundreds of jobs with one click applications, but make sure you are really sifting through and getting rid of all the jobs that are irrelevant to you. Be really specific with your search. Use a job search engine, such as Strike-Jobs, type in a key word which directly relates to the job you are looking for, and where possible type in the name of your city or town or even your postcode with a limited radius. If you want to work locally then limit your search radius to just a few miles from your post code. • Check the local and national newspapers for job postings. The local newspaper would be the best to check if you live in a small town or village, and the nationals might be best if you live in a busy area or city central where big companies are based and will be advertising. A lot of local newspapers have daily or weekly job pages where local businesses advertise as it is fairly cheap to do so. Although a lot of job applications are done online, businesses still value printed advertisements and some even prefer it. Checking the local paper is a guaranteed way of finding jobs that are close to home. • Research local companies and send out speculative CVs. If you are looking for a receptionist job then why not send out CVs to all the local companies with a covering letter asking if they have any work available. Just think of how many offices and work places you pass every day and contact them. A lot of jobs are advertised internally, which means they aren’t advertised to new people, and sending a CV in randomly at the right time could mean you are put forward for an interview. Network with friends, family, ex-colleagues, friends of friends, your Aunties friends brothers step-mum; you never know who might be looking to employ you! Never underestimate the power of networking. Get your name known, tell everyone you know that you are looking for work locally and they can spread the word. Stay connected! Local websites are a hub of information about your village, town or city, which includes tourist attractions, local knowledge and job postings too. 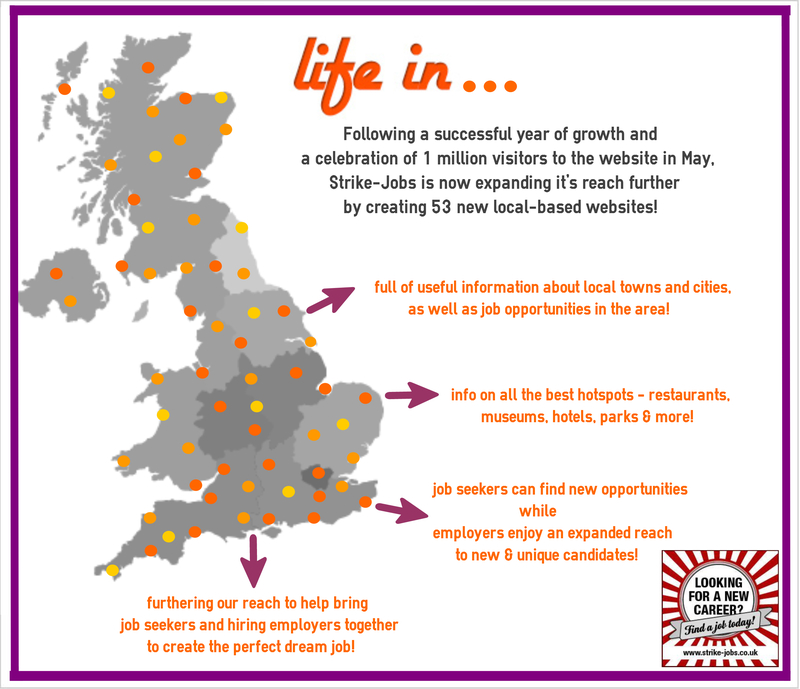 Strike-Jobs has realised the potential of these local websites and has launched 53 ‘life in’ websites, for example Life in Belfast, Life in Glasgow and Life in London. The ‘life in’ websites have been created to provide candidates, job seekers and the general public with useful information in their neighbourhood along with local job opportunities. Each website is designed to provide local job opportunities to candidates and job seekers who are looking for new career opportunities within their area. With a rich wealth of knowledge, each of the local websites is the perfect platform for you to start searching for your new local job. Find your local site below! This entry was posted in General Posts, Search Jobs by Location and tagged how to find jobs. Bookmark the permalink.